A new Explore screen is coming to Freeview Play TVs, showcasing the best on demand content available as well as providing quick access to on demand players. Essentially, it brings more of a BT YouView or Sky Q-style experience to the platform, with suggested content, images for each show and the ability to search all 20,000 programmes on the platform. The recommended content will be from BBC iPlayer, ITV Hub, All 4, Demand 5 and UKTV Play, although Freeview says that more broadcasters will be featured as they join Freeview Play. There's also a new Help and Alerts area which will help the not-insignificant number of smart TV n00bs to get to grips with Freeview Play. 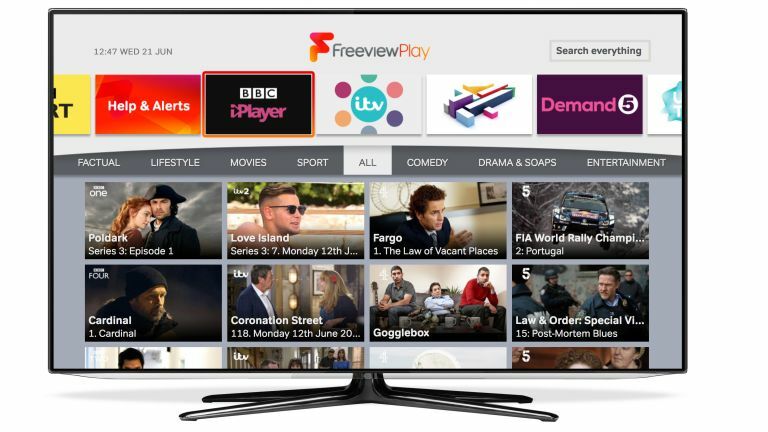 Freeview Play is the latest version of the renowned free-to-air digital TV platform that mixes catch-up and on demand capabilities, so you can go back in time if you've missed your favourite show, just as you can on YouView. Over 1.5 million Freeview Play devices have now been sold and over 20 tech brands support the platform. It's similar to the capabilities offered by the likes of Sky, Virgin Media and BT or TalkTalk with YouView. The 2017 updates to Freeview Play include support for Ultra HD 4K and HDR content for programmes delivered via broadband (depending on your equipment and connection speed). More features are slated for later this year.